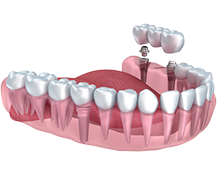 Most patients are now eligible for dental implants and new, functional replacement teeth in the same visit. Due to major advancements in technology, Dr. Rapoport and Dr. Schuler can provide most patients with immediate, same-day dental implants and new, functional replacement teeth in the same visit. Thanks to these developments, you no longer have to wait the many months it can take for bone grafting and implants to heal before you can have functional new teeth. Our Same-Day Tooth Replacement procedure can be done for an individual tooth, a number of teeth at the same time or for an entire arch. The artificial teeth that are placed on top of these implants can consist of a single dental crown, a dental bridge or a full-arch set of new teeth. 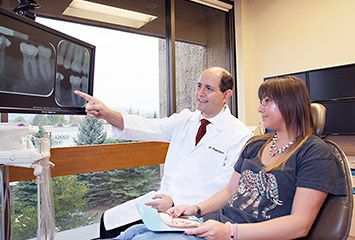 For full-arch tooth replacement, Dr. Rapoport and Dr. Schuler can provide fixed-in new teeth that are supported by four specially designed and strategically positioned implants. Known as the All-on-4® New Teeth in One Day procedure, it is an economical way to replace your entire dental arch and have near the same chewing power as natural teeth. Who are Candidates for Same-Day Tooth Replacement? 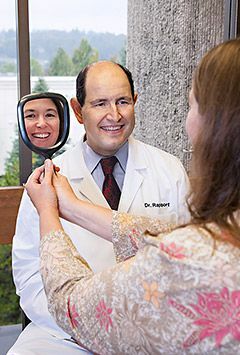 Our doctors will explain your treatment in detail, so you know what to expect during each step. People who do not have severe bone loss in their jaw can be candidates for implant placement with functional teeth mounted in the same visit. Almost all patients who have broken-down teeth that still need to be extracted before replacement are candidates. Many patients who already lost their teeth some time ago are also candidates. Your eligibility for same-day tooth replacement will be determined during a thorough examination and consultation with the doctor. 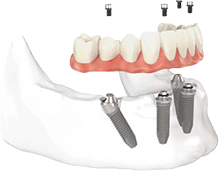 Our same-day tooth replacement protocol is very precisely executed. Our doctors use special technology for extractions, preparation of the implant site and protection of the newly placed implant as it heals. Your restorations are made to fit perfectly against your adjacent teeth, which prevents food traps and possible bacterial infection. Because of these advanced procedures, the treatment is far more comfortable than certain multi-step procedures which can stretch out for up to a year. 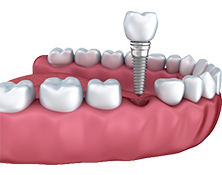 Placing implants and providing immediate tooth replacement is also more conducive to a positive outcome, as there is less opportunity for bone or gum shrinkage. Additionally, our precision in each aspect of the treatment makes it possible for the implants to heal faster. Come see one of our doctors for a full exam and consultation and find out if you are a candidate for Same-Day Tooth Replacement using dental implants. If you need full mouth dental implants, you will learn if you are a candidate for All-on-4® New Teeth in One Day.